Judea Brigade commander explains IDF security arrangements to protect tens of thousands of worshipers in the city of the patriarchs. More than 35,000 Jews visited the biblical city of Hevron and prayed in the Cave of the Patriarchs to commemoration the holiday of Sukkot over the past two days. Major Eitan Dana, the Commander of the IDF Judea Bridage, discussed the extensive preparations required to ensure security for the thousands of visitors in an interview with Arutz Sheva. "The Sukkot holiday is the high point for us during the holidays of Tishrei, both in terms of the number of visitors in the area and in terms of the complex security deployment by all the security bodies in the Judea Brigade district," Dana explained. 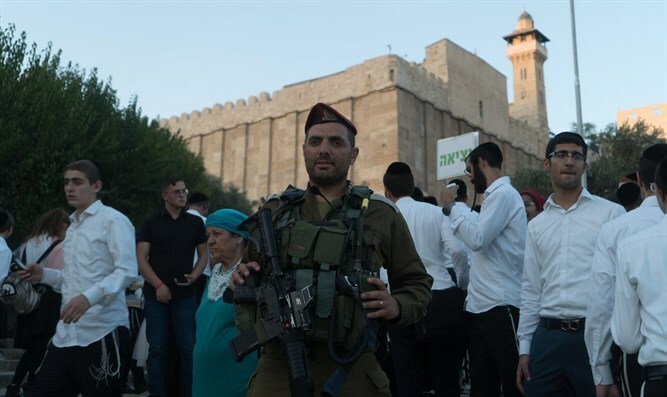 Over the past few weeks, IDF forces have been working day and night throughout the area, in order to allow the many visitors and worshipers to arrive at the City of the Patriarchs and Kiryat Arba. "We are very pleased to see that the work and planning of many weeks are reflected in the tens of thousands of visitors who choose to spend the holiday at various sites in our area, especially the Tomb of the Patriarchs," said the officer. "The many visitors and the systematic increase in numbers from holiday to holiday are the mirror of security and the sense of security in the sector. "We have the right as an army and as a regional brigade to continue to protect the tens of thousands of residents and visitors in the area, to allow quality of life, to allow people to go out and travel, to sleep at night in the sukkah in the yard of their house."